Q: Who will like your book? Time in My Pocket is a bit of a mixed genre. Its time travel element lands it in the SciFi category. But its sarcastic humor – especially relatable to parents with small children – makes it seem light for that category. I’d say anyone interested in sociological, historical fiction will like this book. Those who wonder how people lived without the Internet or the difficult-to-measure ways daily life has changed in the past 70 years. Or just those who want to step into the life of being young, free and beautiful in the golden years of Hollywood! Q: What was the inspiration for this book? I grew up adoring Back to the Future – like any kid in the 80’s. For years, ideas swam in and out of my consciousness regarding the possibility of ever traveling through time. Growing up, I would have told you my favorite actors were Jerry Lewis, Bing Crosby, Cary Grant and Doris Day. So it was clear what time I wanted to go back to visit. Then in 2016, I heard about Stephen King’s 11.22.63. I saw the interest was still there. That there were people like me also wanting to grasp a bit of history. To relive a part of the past we were not privy to. So when I couldn’t find the exact time travel book I wanted to read, I wrote it. About halfway through Time in My Pocket, I was talked into attending a past life regression through hypnotherapy. It completely altered the direction of my novel. Thanks to the bursts of inspiration and the yearning to find time to write it, I completed my first draft in exactly six months to the day. Q: How did you find time to write a novel? Now that’s a funny question. When I was 17-years-old, I was halfway through my first novel. By age 24, I had completed and tossed aside three novels. And from age 24-34? Radio silence. Why now? Why not when I was in the midst of single life with more hours of boredom than I care to admit? Why not the years when I lived alone with no cable or internet? Why had I decided to embark on what is essentially creating my own business and brand while working as a Communications Manager for an international organization and being a part-time stay-at-home-mom raising two children under age four and a dog prone to mid-day seizures? After years as a single girl with all the time in the world, I married, had babies and spent an unplanned year as a stay-at-home mom. Not working. Barely freelancing. I couldn’t carve out five minutes for myself. So when the babies got a little older, I worked hard to set up a life that included writing time. Every other Tuesday, I started my part-time job one hour later in the day, but the nanny worked the same hours as usual. This left me with precious alone time. After dropping off the littles and dashing to a coffee shop, I had exactly 47 minutes before I had to leave for work. That was the start. Sprinting to the coffee shop and typing as fast as I could. Next, I enlisted great friends who agreed to watch the kids every Sunday for three hours. Add a few nights after the kids were asleep and a few stolen moments when my supportive husband took them out and walah! a book was written. I read somewhere (completely uncredible) that self-publishing success is 10% good writing and 90% marketing. Working in the field of marketing and communications, I wasn’t sure how to take that. After attending my first writer’s conference and hearing many negative stories about traditional publishing experiences, my mind was made up to pursue it alone. Of course, I wasn’t really alone. I was and continue to be supported and surrounded by a myriad of friends willing to help me out. I look forward to publicly thanking them all as the pieces of the self-publishing process come together. Being a creative person with creative friends, the task of self-publishing seemed manageable. Though learning just how much work it is, I realize this path is not for everyone. Q: What kind of research did you do, and how long did you spend researching before beginning a book about the past? I’m a student at heart. I always enjoyed school and learning. So when I got the inspiration for this book, I spent months sifting through searches on the Internet. I don’t know how writers created accurate historical fiction before the Internet! One search would lead me to a different nugget which led to another. I was fascinated. In total, I probably spent two or three months researching before I put pen to paper (i.e. opened a Word document and typed sentence one). Before my husband and I married, he had a (semi-real) rule that I was not to call him after 10pm. He knew after 10pm my thoughts drifted to life after death, religion, poverty, consciousness… you name it. We joke about this rule now – as I lie next to him in bed and ramble for hours about the meaning of life until well after 10pm. I know you’ll gasp when I tell you, but it’s… wine. I adore a (cheap) glass of Pino Noir (or three), but I have to accept drinking one means no writing is going to get done that night. Boo. When I first read Nickel & Dimed, I was the Assistant Manager of an Emergency Food Shelf. It hit home and shaped much of my 20’s “money thinking” when the words in the book echoed what I saw each day at work. And when I discovered AJ Jacobs, I was delighted and a little bit devastated because his informal, humorous tone paired with exciting sociological experiments had been completed and written to a degree I couldn’t have fathomed. He remains my favorite writer. Q: How about children’s books? After the birth of my daughter, I swapped sociological nonfiction for children’s books. Dr. Seuss was and always will be my go-to in children’s books. In fact, I ordered a few of his obscure titles published under his lesser known moniker, Theo. LeSieg, when I first found out I was pregnant. Later, after receiving a baby shower gift of Pajama Time by Sandra Boynton, our family became collectors of her work as well. With my wordsmithy daughter growing her literary tastes, we have recently entered the wonderful world of Mary Pope Osborne’s Magic Tree House series. 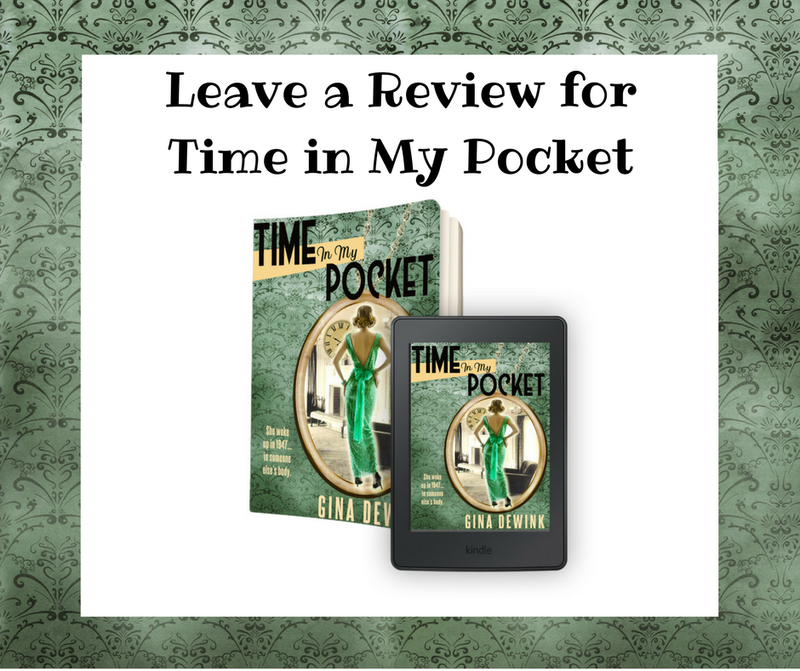 I’ve been gnawing on the idea of writing a sequel to Time in My Pocket. I have ideas in so many different directions at this point that I’m honestly unsure. But beyond novels, I’m continuing to freelance and navigate life with young children. And my amazing husband is working to complete our 1969 Pontiac LeMans this summer. So perhaps inspiration to capture moments from the past will arise on a family cruise to a classic car festival.